Advantage Limo of NYC offers a luxury service pertaining to the competitive advantage of a worry-free/hassle-free Transport. Advantage Limo of NYC provides group excursions and all matters of transport, i.e. Airport, Funeral Visits/transport, shopping, work, etc. With our professional line-up of drivers, all serviced rendered are at best of industry experience that this line of luxury transportation can offer. Where premium comfort meets personal service. Call today to setup travel arrangements. No matter the time of day, weather or service request. Find out about top events taking place in NYC at nyctourist.com, and contact us about the best transportation options for you. When you need a driver who values your time as much as you do, Advantage Limo of NYC will be there. Built and designed for every situation imaginable Advantage Limo can provide you with the luxury transportation, packages and options your group requires. 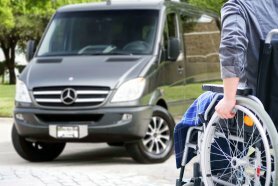 You will have the unique opportunity to choose from a wide range of wheelchair friendly limo models, packages and options that are tailored to your needs and requirements. Advantage Limo luxury fleet consists of different and most up to date vehicles, regularly serviced and maintained to the highest standards of performance and cleanliness. Advantage Limo luxury fleet consists of different and most up to date vehicles, regularly serviced and maintained to the highest standards of performance and cleanliness. Built and designed for every situation imaginable Advantage Limo can provide you with the luxury transportation you need. A wealth of comfort and convenience features awaits passengers in the brand new Lincoln MKT Stretch Limo. Mercedes Sprinter Limo Bus is all about comfort and safety. Featuring plenty of room for 14 adult passengers. Advantage Limo was primarily created for those who need a personal driver, a first-class car and business class trips. For those who value their time and impeccable comfort. We provide guaranteed high-quality service and offer only luxury cars. Reliability, safety, comfort and at the same time reasonable prices are the main reasons why we offer you to use the services of our company. Among our services, you can find the most suitable option for you, or you can call our manager and he will help you make the right choice of a vehicle. We pay particular attention to passengers in wheelchairs. In our fleet there are cars designed specifically for such trips. We provide services 24 hours a day and 365 days a year. Our advantage in the wheelchair service is cooperation with business partners with over 20 years experience in the sphere of emergency medical services. 1.High quality of service: from an order to a completion of the trip you will be satisfied with the quality of service. 2.Luxury cars: only the best vehicles for you from a passenger car to a 36-seater bus. 3. The ideal technical condition of the vehicles: we do all the necessary checks-ups for our vehicles on time. 4. Efficiency of booking: our managers will help you quickly make a choice of a car for your needs. 5. Punctuality and responsibility: you can be sure that you will be provided with a car at the exact time, and the trip will be conducted at the highest level. 6. Travel insurance: you are safe because every trip with Advantage Limo is insured.